Have recently been approved in the US and is called Kybella®. This is a purified chemical that makes up most of the fluid that is stored in and released from the gallbladder. It helps us dissolve the fat in our diet! When injected into the fat in the form of tiny droplets in a precise pattern, it kills the fat it contacts. The body then "gets rid " of the fat over the next few weeks. This will need to be repeated two to five times at least a month apart. Each "dose" costs about $1200 (3-5 doses will cost $3600 to $6000). Experiencing a bit of swelling after each set of injections is quite common. 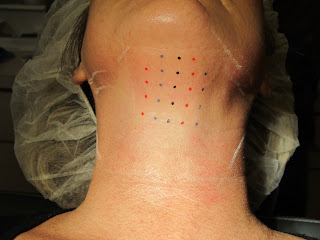 Final results are pending on this patient and usually can be seen a month after the last injection set. So many options to choose from! Getting the correct advise from a provider that has multiple options available is a must otherwise you will become "the nail for the hammer:"! consulting with A board certified Plastic Surgeon that has surgical options (They may be more appropriate!) 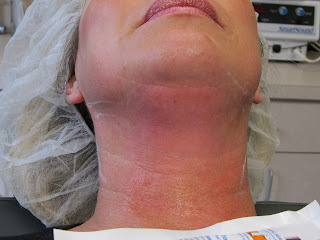 would be your best bet to get the best treatment for your Double Chin!